By Spencer. If Spinal Tap taught us anything, it’s that rock is all about volume. Looking at the Smashing Pumpkins catalog, though, it’s easy to take a slightly different spin on that lesson. Because to them, volume isn’t just a matter of loudness – it’s a matter of quantity. Their wealth of extra material had already given us the 1994 B-sides collection, Pisces Iscariot, but after a double-album as epic as Mellon Collie And The Infinite Sadness, there couldn’t possibly be leftovers, right? Right? Just one year later we got our answer. 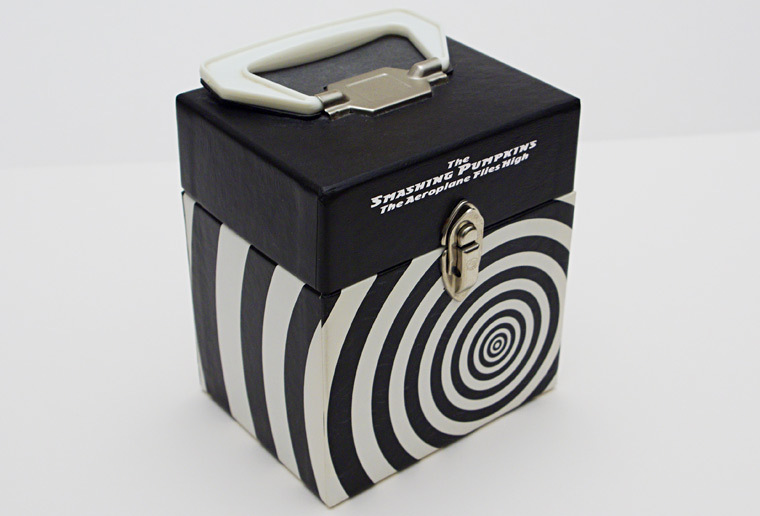 Five discs, thirty-three songs, and a ridiculous Buck Rogers-looking package that put the “box” back in “box set,” The Aeroplane Flies High was a case study in showing off. It was a message to the rest of the music world: the only person who could ever top Billy Corgan was Billy Corgan, so don’t even bother trying. What’s shocking is that such a blatant exercise in excess contains some pretty fine material. 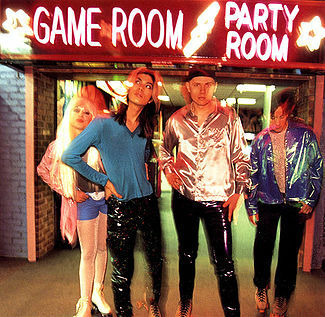 At this point in their career, the Smashing Pumpkins were musical schizophrenics, and the five discs on Aeroplane each focus on a different side of their personality. The 1979 disc is the most interesting among these, foretelling the future direction of the band. Corgan was clearly bored with guitar rock by this point, and he’d always had a fetish for 80s new wave like The Cure and Depeche Mode. Hints of this had already appeared on Mellon Collie with songs like “1979” and “Beautiful,” but the B-sides on this disc show it was more than just a passing flirtation. “Ugly” takes what could have been a disposable grunge number and recasts it in gloomy underwater echoes and pulsing drum clicks. By lurking in the quiet, it actually feels heavier, like distilled self-loathing. “Cherry” features maybe the best bass line D’Arcy ever recorded underneath layers of retro keyboard and a gorgeous vocal melody. But the stand-out track is “Set The Ray To Jerry,” a B-side so beloved by fans that it actually appeared on the band’s greatest hits album a few years later. Jimmy Chamberlain’s drums gallop and the bass line rumbles at a pace you would never expect for a song that, in its melody and its tone, is really a ballad. It’s Corgan at his most heartfelt and his most unconventional, and in all my years of devouring music, I’ve never heard a song that sounds remotely like it. The 1979 disc is so strong because it feels like this area of electronic pop and new wave is where Corgan was actually enjoying himself; his creativity is running free and the songs have direction and vibrancy. By contrast, the Zero disc – which focuses on the same dark metal sound as its namesake track – is Corgan going through the motions. While “God” features some hellish drumming and “Mouths Of Babes” and “Marquis In Spades” both show off some mosh-worthy riffs, these are the kind of songs the band has done a thousand times before – as evidenced by the “Pistachio Medley,” a throwaway mash-up of some 70 guitar riffs, most of which were never recorded as full songs. It’s Corgan going out of his way to let everyone know that he can do this kind of thing in his sleep by now. The Tonight, Tonight disc, made up of acoustic ballads, is unremarkable aside from the gorgeous “Jupiter’s Lament” and a nice acoustic version of the title track that, when compared with the album version, reminds us how transformative a wider set of instrumentation can be to what is at heart a very simple song. Meanwhile the Bullet With Butterfly Wings disc compiles some decent covers of songs by Blondie, The Cars, The Cure, Alice Cooper, and Missing Persons. The final disc, Thirty-Three, is a bit all over the place, but “The Last Song” has an appealing simplicity (and a guitar solo by Corgan’s dad) and “The Aeroplane Flies High (Turns Left, Looks Right)” closes on a fun jam session that rocks harder than anything else in the box. So what does The Aeroplane Flies High mean within the broader context of the Smashing Pumpkins discography? For starters, it’s an obvious testament to Billy Corgan’s prolificacy as a songwriter; only Bob Dylan comes to mind as an artist capable of topping him in sheer numbers. And it’s the culmination of Corgan’s love for the B-side, which is itself an expression of his love for his fans and the desire to hold nothing back from them. While most artists take a more selective approach to their releases, putting forth only their best work, Corgan puts it all out there and lets us sort the wheat from the chaff ourselves. There’s something very classic rock-and-roll about that, recalling the days of trading bootlegs and rarities among the truly fanatic. Most importantly, The Aeroplane Flies High was the apex of the bigger-is-better mentality that had consumed the Smashing Pumpkins those past three years. In that short time span they had officially released a staggering 83 songs, with each new release trying – and succeeding – in outdoing the last. But even as they had become the biggest thing in rock music, the band itself was literally shrinking with the loss of Jimmy Chamberlain. Their next album would inevitably be smaller. It would also be their most beautiful. Awesome! Glad the series continues on and I’m glad you gave TAFH it’s own post. It’s a curious thing. While I like the Tonight disc more than you do, we agree that “Set the Ray to Jerry” is a truly special song. Love it. Man, that song has gotta be in my top 5 Pumpkins songs of all time. Once I’m done with the traditional releases, I’m gonna have to do a close-out piece just on the Pumpkins’ B-sides, because they really do have a wealth of good ones.